Special thanks to fellow blogger, Sweet Blessings, for allowing me to share this wonderful work she created! 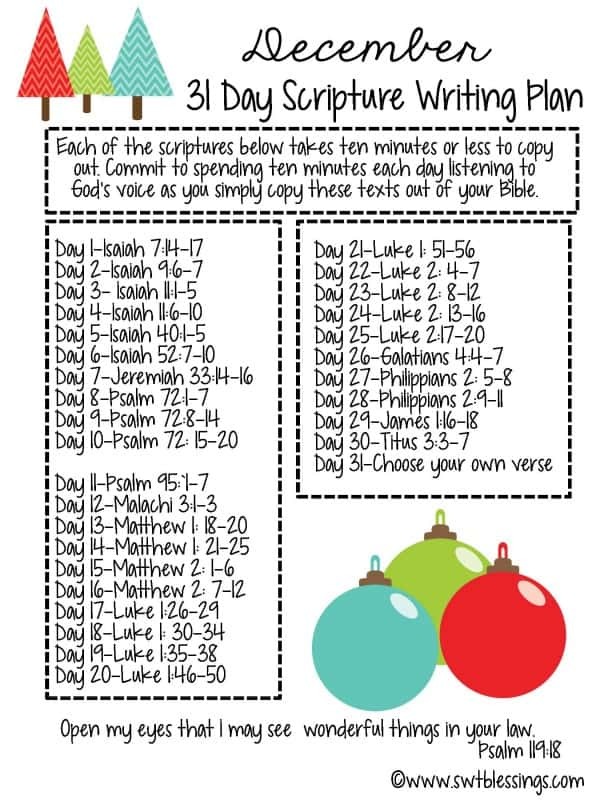 A few nights ago I happened upon the most amazing graphic on Facebook, a Scripture Writing Plan! I don’t know about y’all, but I have such good intentions of getting deeper into the Word and still it seems more and more difficult to quiet my mind each morning and evening when that time comes. I’ve found that not just reading, but writing the word of God helps to draw my focus in a much deeper and more meaningful way, so seeing this scripture writing plan was like striking gold. I contacted the creator of it, who is one of the kindest ladies you could ever hope to speak with, and asked her if there was a way I could share it with my readers. She immediately responded back with copies of the chart and told me I was welcome to post it here on SouthernPlate. She also said she’d send me the future months so that I can post those here, too! Please take an opportunity to go visit her wonderful blog, Sweet Blessings, and leave a comment to say “Thank you” to Shannon. I know you’ll enjoy her blog as well so make sure you add it to your regular reading list because it is one of those you could get lost for hours in and still wake the next day wanting to read more! To print this month’s plan, click on the image (English or Spanish) and it will open in a new window in a printer friendly version. Images are generously offered courtesy of their creator, Shannon, at SwtBlessings. Please support her by visiting her blog. Follow along with me as I share photos from time to time this month of my daily scripture writing on my instagram by clicking here. I love this idea, and, like you, find it hard to concentrate sometimes in my Bible reading. Thanks so much for sharing. I have a new journal all ready for this! I love this December Scripture plan, Christy! Thanks so much for reminding us, the reason for the season! God Bless! I like this. Thanks for sharing and yes, I will check out her site. I started back this summer just going through and copying all of my favorite verses underlined in my Bible. I ordered me a cute journal for it. I even added lyrics to hymns to this journal. I love writing the Scriptures. Really does help to focus. I am going to add this to my plan. I hope you enjoy Sandy!! LOVE this idea. I’ll visit her site soon. What a wonderful idea! I am trying to think of ways to get deeper into the word and this came up. Thank you, and I hope the good Lord continues to bless you. We have so much to be thankful for:(1) we have a bible, (2) we can read it anytime without fear, (3) we share the love. Amen Peggy!! So very much to be thankful for! Thanks so much! This awesome, will visit her blog as well. Love to journal and this is an excellent idea. Passing this along to my family also : )) Thanks! God bless & Merry CHRISTmas! God Bless and Merry Christmas to you as well Rhonda!! Thank you so much for sharing this…I’m only a day behind. LOVE IT!! I will tell Shannon the same! I started the writings and plan to cut each verse in a strip to place in a decorated mason jar to give as a gift to special family members. Thank you for sharing. Hey Janice! I’m so sorry you have having problems with it. Have you tried clicking on the photo and then when it opens in another page printing? If you click on the title the same thing should happen. I printed off two this morning with no issues but hopefully we can figure out what is going wonky with yours. I found this in my Facebook news feed on December 1, so I started right on time. Thank you for a more permanent copy! Merry Christmas to you and yours. Merry Christmas to you Kirsten!! Thank you so much for sharing this with all of us! My days are so busy, it seems like the minute my feet hit the floor I can’t find time for anything for just me. This is just the inspiration I need to find that time and make it happen! Looking forward to the new ones in the coming months! 🙂 I think so many of us feel that way Karen. And it always seems like things just continue to get get busier and busier. I LOVE this Christy! Writing the scripture really helps stamp it in my mind for the day! Thank you so much for sharing this! Thank you so much for sharing this. With all the husle busle of life it is hard to (sorry to say it out loud) but find time to sit down and talk to God. This really helps. Will there be one for each month? I have written scripture since I was a teenager and still do at age 50! I do it as a daily devotional besides just reading. In fact, I have my own plan that I do it but I always welcome NEW ways so I can ADD to my time with God! Win-Win ~Thank you both (creator of plan and you) for sharing! Christy, what a wonderful way to get God’s Word into our minds and hearts. This will be part of my daily quiet time this coming year. Have a blessed Christmas this year and a blessed year to come. A very Merry and Blessed Christmas to you Janel!! 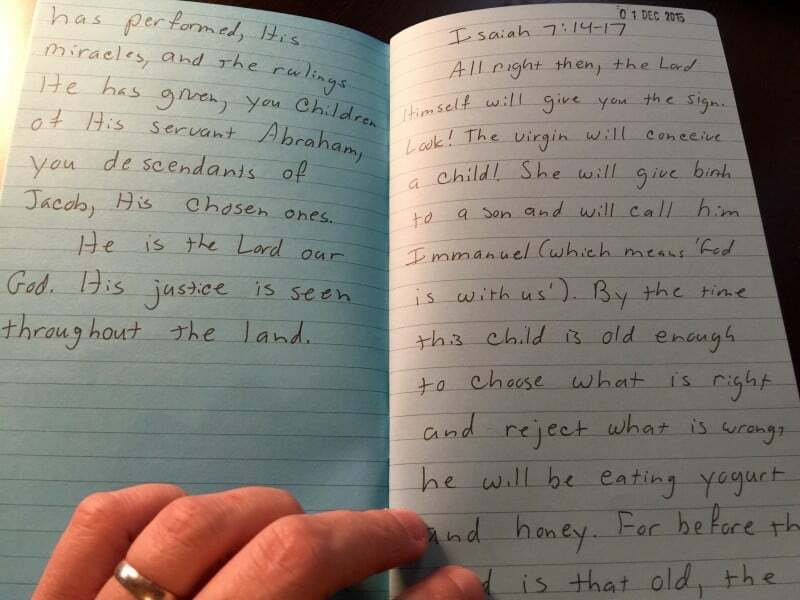 I started writing out scripture 2 years ago and have filled many many pages with God’s Words! It has helped me so much get through some horrible and trying times these last 2 years. I love having a plan to follow though! Thanks for sharing this! do you have a copy of the September Scripture Writing? I am missing that one and it is no longer on her website to print. I’m not sure Glenda will see this but I read all the comments and try to respond to all of them, too. I went and checked on the September one and found it under “Scripture Writing” up at the top left of the page (top left is where you find that to click and see them all). I don’t see any issue with it printing but if I am missing something please let me know. Hello! 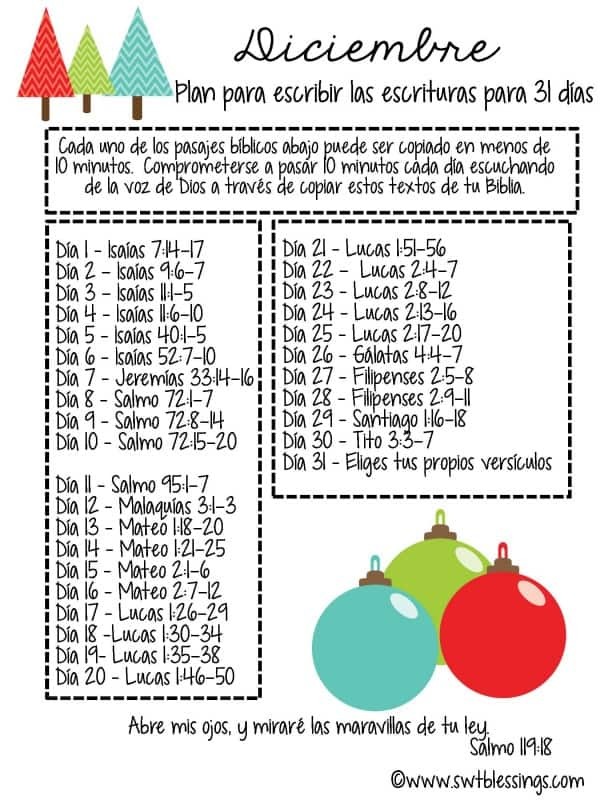 I am trying to start a Bible scripture book using your downloadable Scripture writing plans. I have come across something strange. I can open all the pages and copy them all but September. I am so sad and that is the only one I can not find to add to my book. Please help me. It keeps saying that the p[age no longer exists. That is very strange that that is the only page that is no longer on here. Hey! please see my comment right above this. It opened fine for me so maybe you were looking somewhere else? Holler back if need be!